Naresh Kumar, PA to Shri R.K. Asthana, IAS, is his boss’s doorkeeper. There is a share for Naresh in the bounties that flow in through that door, and there has been for years. But he is a man besieged. His married daughter is having trouble conceiving, his son’s call centre job might be a cover for something murkier, and his wife expects him to solve these problems. Then there is Pinki Kaur, a colleague and his friend’s widow, whose presence in the office stirs responses in him that he can neither submit to nor suppress. Distracted by personal crises, he misses the signs of political trouble brewing at work, and so it is that Naresh finds himself suspended from his job. Unseated from the desk that has been the source of his power and well-being, he must still struggle to make things right for his family: Naresh is, after all, a householder. With uncommon acuity, Amitabha Bagchi writes of a world where favours are currency, where access to power sometimes feels like a prerequisite for survival, where power can be both total and ephemeral. 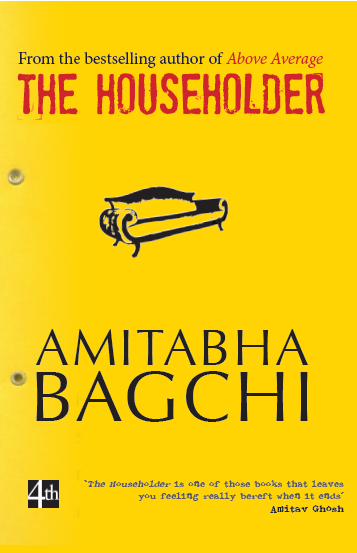 The Householder is a view from within this world, an examination of the moral condition of our times.